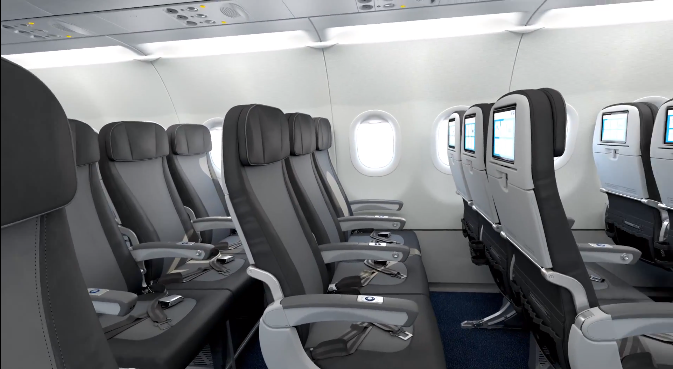 JetBlue, New York’s ‘Homegrown airline’ has released on their video channel a sneak peek of what we can expect on their new fleet of A321’s coming out in 2014, which will be flying the transcontinental East Coast – West Coast flights, competing with the likes of American, United, Delta and Virgin America who have all lifted the quality of product for the 5 hour trek. 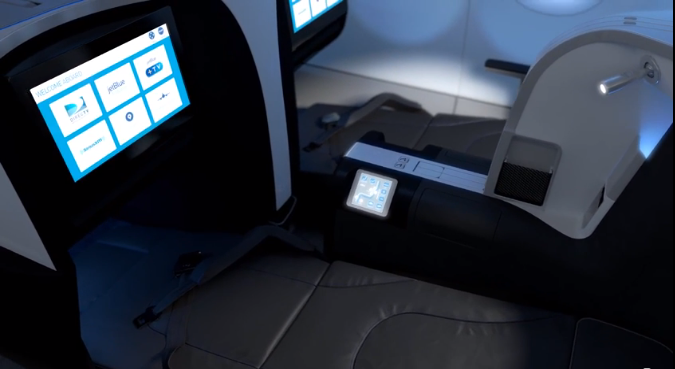 Whilst the airline hasn’t announced any press release on the product, and we will no doubt expect it in a few days time, it’s easy to see the airline has invested in both business and economy, featuring slim-line seats, with larger touch-screen TVs, and still maintaining their extra legroom seating. Whilst this is just an artists impression the detail seems fairly accurate, and we can see the headrests will be fairly slim too. Perhaps lowering the comfort of their seats, they can up-sell their amenity packages of pillows and blankets. The big showpiece here though is the business class product. A first for what is fundamentally a low cost carrier. 16 Private Suites in 4 rows, rows 1 and 3 featuring a 2 x 2 seating and rows 2 and 4 having a more private 1 x 1 seating configuration. The seats aren’t fully flat, instead they seem to be angled lie-flat seats, in a similar product to that seen on international carriers such as Delta and Brussels Airlines, which still offer a similar comfort, as long as the seating fabric isn’t leather, in which case, expect to be screwed up in a ball at the bottom of your seat when you wake up. 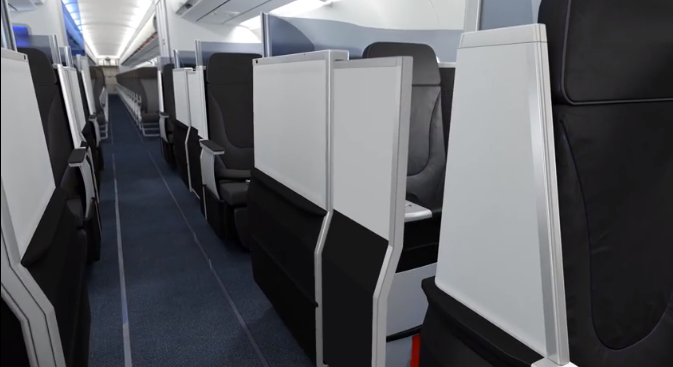 The private sliding door idea is a nice little touch, especially on the single solitary seats, however, on the dual seats, you lose out on this feature. Making the 2nd and 4th rows much more appealing and sort after as a solitary traveller. We feel the sliding doors are more a sales gimmick that practical elements a traveller really actually requires on a 5-6 hour flight. The inconsistency of the product in business class may also work against the carrier, as someone who flies in the private suite and then is only offered a regular business class seat may decide to decline the purchase and move to a differing carrier. Only time will tell…..